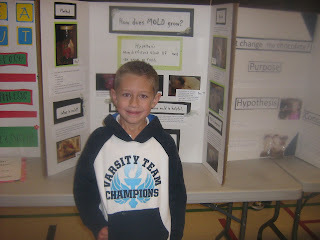 Is it really possible for a healthy six-year old boy to go from rocking the first grade science fair, to being ambulanced to the hospital because he cannot breathe on his own in less than 12 hours? Yes, yes it is. Ty took the ride every little boy dreams of and every mother has nightmares about Friday morning. After starting what seemed like a simple cough Wednesday, less than 48 hours later he was barely responding to us and struggling to breathe. After a good time at the school science fair Thursday night Ty came home, practiced his spelling words and was promptly tucked in bed. I gave him some cough medicine to ease what seemed like an innocent change-of-the-seasons tickle in his throat and off to bed we went. 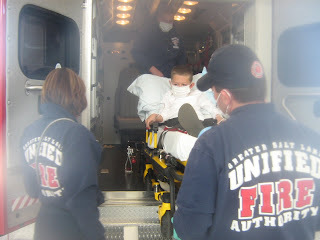 By 10 o'clock that night when Matt and I checked on him he was wheezing and spiking a 104-degree fever. We were worried. 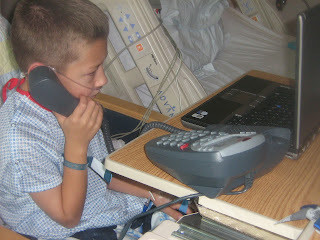 I called the 24-hour nurse hot line. What a joke. "Make sure he washes his hands frequently," she read to me from a computer screen. "Look, I'm telling you his symptoms and I need to know if I should take him to the hospital tonight or wait to see his pediatrician in the morning," I said. "Give him some Motrin and call the doctor in the morning," she advised. So I did. We arrived at the doc's around 10am. 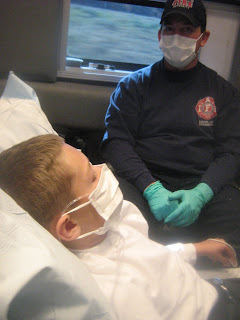 By 10:20 he was on oxygen support and undergoing a rapid strep and H1N1 test. They both came back positive. I was shocked. No. No way. We have done EVERYTHING short of crawling into a hole to prevent this moment. There was no way this could be happening. I could feel tears running down my face. The doctors conferenced and decided to give him an Albuterol treatment right away to try to open up his lungs. They slipped the mask over Ty's nose and mouth and he began to cry. "Am I going to die?,"he asked me. "I'm not ready to leave you." Great. Another star on my forehead for overstressing the absolute necessity of the H1N1 vaccine he received 10 days prior by employing fear tactics. "Kids are dying from this flu," I told them. "You HAVE to get this shot." Yes, I know. I'm awesome. "Of course not buddy," I said. "Do you want me to ask the doctors so they can explain it to you." He nodded because moms lie, but doctors have to tell you the truth. It's the law. His doctor patiently explained that we were not pioneers. If we were he would be in a bit of trouble. 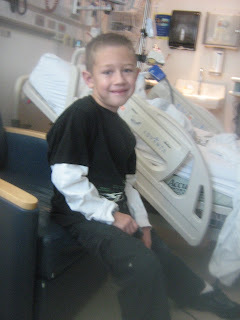 But since it's 2009 we have medicine and oxygen and all kinds of ways to help him get better quickly. I could tell he believed her, but he was still pretty upset. "We're calling an ambulance for you," his doctor said. "I have my car. I can take him," I told him. "He needs an ambulance. He cannot take that ride without medical supervision." Ughh. My stomach sank. This was bad. 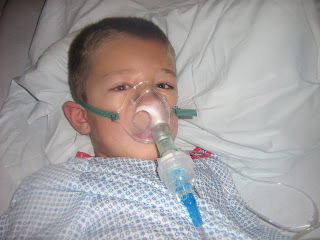 When we got to Primary's they started more breathing treatments. And by the end of our three days there, he was a pro. Of course, a little room service never hurts in the healing process either. Too bad he didn't feel much like eating until it was near time to go. It was easy to tell when he was feeling better. Suddenly, he seemed to have a home office set up. He was playing games online. Taking phone calls from friends. Requesting Popsicles from the nurses. Honestly, this was life and death just 36 hours ago? Yea for good drugs! We packed up our little circus and made our way home with a shiny good-as-new Ty in tow about 11:00am Sunday with a note in hand that says he's ready for school tomorrow. Really? I think I may give him an extra day off for good measure. The scary part now is the waiting. Who will show symptoms next? Maybe all of us, maybe none of us. The doctors couldn't say for sure. For now, we're making Ty wear a hospital mask when he's around his brothers and I'm boiling, make that washing, everything the child has even thought about touching in the last week. I am here to tell you to PAY ATTENTION to your children. Little cough, slight fever, acting just a bit off? TAKE THEM IN. Do not wait. Who knows what kind of a mess we'd have on our hands if I'd let Ty go even a few more hours. I really cannot even think about it. Even if your kids have had the first of their two H1N1 shots, they are not immune. Apparently the vaccine takes a good 10-14 days to provide any protection. Can you say false sense of security? I had for all intents and purposes, checked the H1N1 worry off my list. They think Ty contracted the virus about 8 days following the vaccine, but it is possible he was infected a full 7-10 days prior--making it possible he even caught the virus while getting the vaccine. Perhaps the CDC will rethink asking thousands of people to gather to receive a shot for a flu that is best prevented by avoiding large gatherings of people...!! As for us, we'll roll with whatever is to come. I'm running a little low these days and can feel myself getting very close to the edge. The edge of what? I'm not sure. I think I'm too afraid to look down. Tonight I'll try to regroup. To collect a little cup of calm and hold on tightly. But please, I must request that no one else tell me,"What have you done to deserve this?" "Why do bad things happen to good people?" Those are questions that make a lot of assumptions--about us and about the way God works. My God loves me. He sees me through these trials. He doesn't subject my children to life-threatening situations to punish me. Yes, I have many flaws--most of which I'm fully aware of and am working on the the best way I know how. I need the Lord. I am not afraid of Him. I do not blame Him. He has once again shown His mercy and once again reminded me of the need to simplify and focus on what matters most. Here's to hoping my soul will be brave enough to do what He asks. My life is full. I send so much love to all of you for your prayers, support and thoughtful actions. It's an amazing feeling to have family and friends who might as well be blood to trust and rely on. We are blessed. xoxo. Oh my goodness, Mindi. I don't even know what to say. We will keep your family in our prayers. 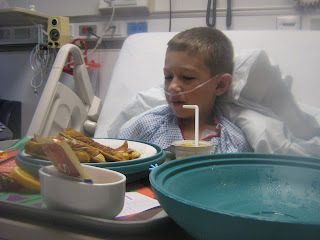 I don't know if this helps, but my nephew got H1N1 (he was on the JV Football team and he had to be quarantined for two weeks - this was last Spring) and nobody else in the family got it. He is the third of six kids - all living under the same roof. Hopefully Ty's case is isolated as well. What can we do for you? Is there anything that any of us can do to ease your stress? Please let us know. Oh Mindi. Please let me know of there's anything I can do for you. I'm so glad the little guy is ok. I can't even imagine how stressful that had to be for your family. What a whirlwind! Sounds like Ty will have quite a story to tell for a very long time. What a trooper. Glad he is feeling better:). Just so sorry you had to go through it all. Tyler is one tough kid! Crossing our fingers that everyone else stays healthy, and grateful for your perspective that is so refreshing. You always remind me to hug my loved ones a little tighter and motivate me to try a little bit harder to be better each day. Oh the irony of getting the dreaded bug despite every possible precaution!! I am so sorry for you and your family going through this scary week. Yuck Yuck. For some it may rain and then pour.... with all that McKay has been going through too, I would dare say a tsunami is drenching you guys! Best plan of action? Go buy a darling new pair of rain boots (or something a tad bit stronger than Diet Coke!!) Wish we were closer to help in the boiling process! Wow Mindi! I have to say you passed the test. We pray for you daily and know that you and your boys will be watched over. I pray today that you will have a little extra strength, give those cute boys a hug for us. We have done everything short of crawling in a hole also, it seems we have all "caught colds" right in time for my big " due date." Who knows? What can you do!!! I am so sorry! What a scary situation! I HOPE everyone else stays healthy. Uggg, this whole H1N1 thing is crazy :) Hang in there!! Yes, your God loves you, as does your ward family, and your Relief Society President. You rock. Wow, Mindi - what a scary experience! 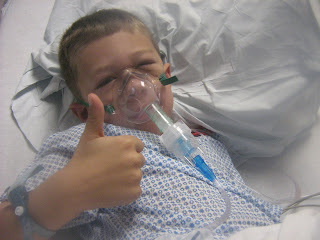 I'm so glad Ty is ok now and I pray the rest of your kids stay flu-free. You are a FANTASTIC mother and we are all rootin' for you and your family here in the office! Mindi...I am so sorry you guys had to go through all of that worry and fear. I just read your facebook and I love that Tyler loved his stay at the nice "Hotel". Kids are so resilient aren't they. You are an amazing person. I have loved getting to know you better through our GNO's lately. Thanks for allowing that. I think your pretty neat. Oh that sounds so scary! I am so glad that you made it to the Dr in time to get him admitted to the hospital. I feel like we are living in bubble, we have our first shot for the kids, but still have 2 weeks before we can get the second one. I am just as concerned about getting the second one as about getting the first one. As of yesterday, my kid's Dr is still not sure there will be enough vaccine for the kids to get the second dose. I do think that if they can, they will save at least one dose for my Heart baby. I am getting so frustrated when I hear people talking about how the government is turning people into fear mongers and that this is all a bunch of hype. Too many people are not taking this seriously and in doing so are putting other children at risk...not just their own. I hope that the rest of your family doesn't get this. If anything, now you know what to look for. Hang in there! I am so glad to hear that Ty is feeling much better. I bet it was scary. You are an amazing person and I hope you know this.